The next L200 will also have a Fiat version. The current generation is pictured. MILAN -- Fiat Chrysler will source a new midsize pickup for Europe and Latin America from Mitsubishi Motors starting in 2016. 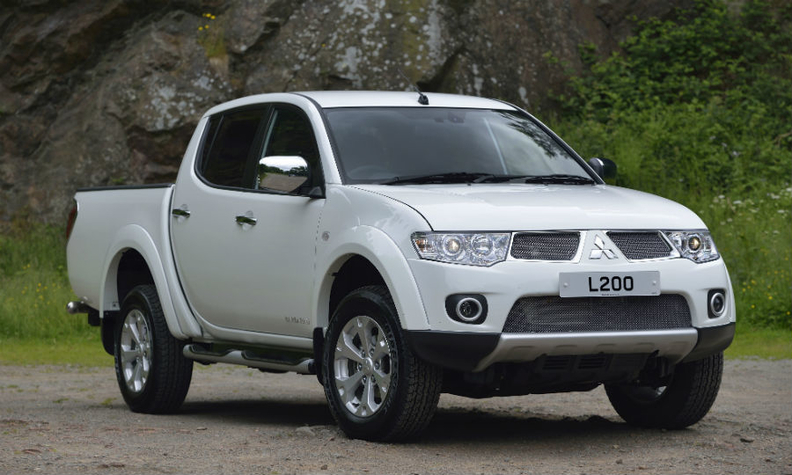 The truck will be based on the next-generation Mitsubishi L200 model, Fiat and Mitsubishi said in a statement today. The deal is supposed to help boost the Italian carmaker's commercial vehicle sales and raise output at the Japanese company's plant in Thailand. Mitsubishi is set to start manufacturing a re-designed L200, also known as the Triton, at its Thai plant later this year. In early 2016, it will start producing a Fiat-dedicated line of the L200, which will be rebadged and sold under the Fiat brand, said Mitsubishi spokesman Tetsuji Inoue. "This is beneficial for both companies because Mitsubishi Motors will boost production and Fiat will strengthen its product lineup," Inoue said. Mitsubishi is expected to supply Fiat with 150,000-170,000 trucks over six years, although the figures have yet to be finalized, Inoue said, adding that the two companies were not considering any further cooperation. The automakers said they have signed a non-binding memorandum of understanding to develop and manufacture the truck. Automotive News Europe reported in May that the pickup will be sold by the Fiat Professional light commercial vehicle brand in Europe and Latin America. Fiat Chrysler’s new five-year plan, unveiled in May, has a pickup for Europe and Latin America debuting in 2016. Fiat’s current lineup includes the Strada, a front-wheel-drive-only unibody small pickup built in Brazil and sold in Europe and Latin America. The Strada was Fiat Professional’s top seller last year with a volume of 134,000 units. Broadening Fiat Professional’s lineup is a crucial element of Fiat Chrysler CEO Sergio Marchionne’s plan to make the automaker’s European business profitable again. Fiat has lost 2.15 billion euros ($2.93 billion) in the region in the past three years, but aims to end losses by 2016. "The Fiat Professional unit is likely already making better margins then the average for the Fiat group and if the two companies share development and production costs, this should help that further," said a Milan-based analyst said who asked not to be named. Marchionne first promised a large pickup with a 1-ton loading capacity in his 2006 business plan. The pickup was due to arrive in 2008 from Fiat’s plant in Argentina sharing underpinnings with Tata Motors’ Xenon, but Fiat decided not to build its own version of the model. Plans for a pickup reappeared in Marchionne’s 2010 business strategy. It was supposed be a version of the Dodge Dakota pickup. That model was never built. Fiat is completing a merger with its U.S. unit Chrysler. The combined Fiat Chrysler Automobiles is expected to list in New York in the middle of next month as it seeks to boost the global clout of the world's No. 7 carmaker. While the carmaker has denied talk it is pondering tie-ups with Volkswagen and Peugeot, Marchionne said Fiat would consider cooperation with other carmakers on very specific projects. Earlier this year, Fiat signed a deal with Renault for the French group to supply the Italian carmaker with a light commercial vehicle based on a Renault platform. Friday's cooperation announcement with Mitsubishi is the second between the two auto groups this year after Chrysler, wholly owned by Fiat, agreed to sell a rebadged Mitsubishi compact sedan in Mexico. This car is also made at Mitsubishi's hard-hit plant in Thailand. Mitsubishi's production dropped 11.4 percent in April-July to 93,000 vehicles in Thailand, where the company is facing a drop in sales and production due to a political crisis and declining demand for cars.